Some more (2)… – …STILL CRAZY AFTER ALL THESE YEARS! In my post two days ago, I mentioned that my friend, Annie, gave me a fish while she was back home in Sibu with her twins during the school holidays. Now, Batang Ai is that place in Sarawak where they have a hydro-electricity project and they are using the lakes in the vicinity to rear fish commercially for sale. Normally, if it is ikan patin from one of those small fish farms in the outskirts of town, I would not touch it at all as there would be this horrible mud smell. I was told that if they have free-flowing water in the farm, the fish produced would not have that smell…and you can be sure that there is all the flowing water that you would need at Batang Ai and the fresh fish from there would not have the smell plus more often than not, they are sold at the market in town ALIVE! Now, how fresh can it get! …and it was indeed very fresh and did not have any of the off-putting smell. …that night at my alumni’s annual reunion dinner was tilapia and most likely from Batang Ai as well but I may be wrong. …or they would use it to cook zhao chai (preserved vegetable) soup. …and I would say that done this way, it tasted really very good. Thank you so much, Annie, for the fish. I am sure you took a few of those home with you to KL – care to share how you cooked yours? 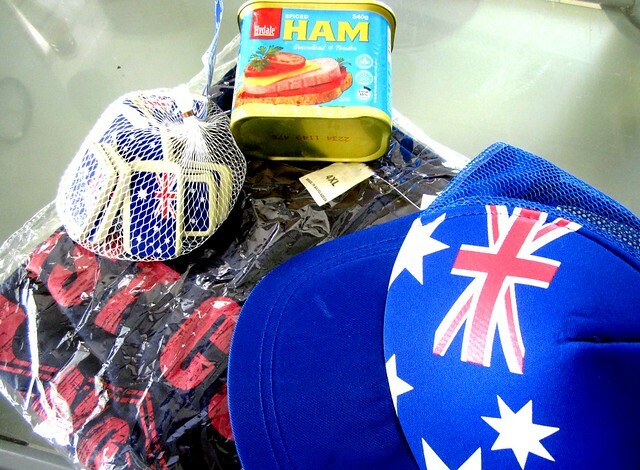 – a 4XL t-shirt, an Aussie cap…and chocolates…and a can of ham. Thank you so much, coz – that was so sweet of you to cart all that stuff all the way. Well, that is it – all the goodies from friends and family for the time being…unless there is some kind soul somewhere who is generous enough to send some more my way? Hehehehehe!!!! Eyewwwww!!!! No, thanks. That’s why I never buy patin or order that in the restaurants. So scared of the smell. I don’t like any fish with funny taste. That’s why I stick to clean tasting ones like salmon, halibut and cod. Don’t mind pomfret too. I don’t mind halibut and cod…but I’m not a fan of salmon – it has its smell too. I think all fatty fish has a smell that needs getting used too. Black pomfret has its own smell as well…but I like. Such natural smell or taste, not the same as the mud smell we get in farmed fish. That would put me off instantly. I don’t know my fish too except ikan bawal putih.. Hehehe. Also I prefer small fish compared to those lots of isi ones. I like kembong & the like too,especially deep fried…but masak kunyit, I think this patin is nicer…but nowhere near our river ikan buris aka “sai seng” – really fatty fish, very very lemak, very very nice. Fresh fish! Nothing like it. Yum. I am also hopeless when it comes to fish. I only can recognise salmon hah! hah! Best way to learn is to walk down the fish section at the supermarket and observe. I also don’t like fish with mud smell. Yuks! I was quite wary about steaming it – dunno got that mud smell or not. At least, masak kunyit…if there is the smell, can drink the soup – will still be as nice. What your lovely wife did made me drool too.. never tried that style before.. Very simple, so easy to cook – you tried the prawns cooked this way when you came to my house – same recipe. Give it a try! Well, I try to bring as much as I can when I travel…or when people drop by in Sibu but I would think many times about sending by post as the charges are killing – really not worth it especially when the thing sent is cheap. 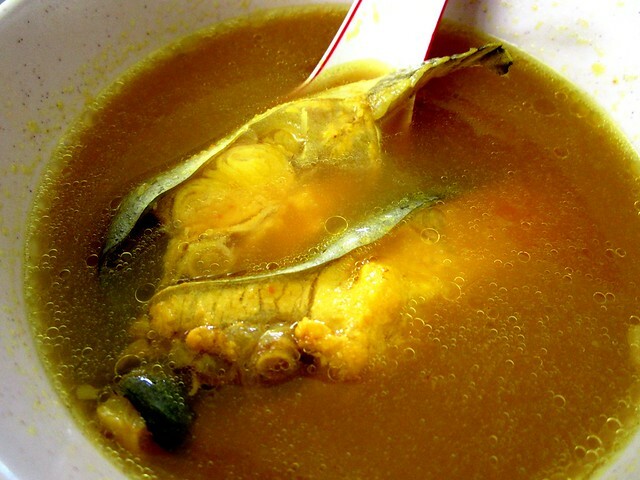 Ikan masak kunyit style…I never try before…it looks delicious. Give it a try! Irene Tan tried and she and the hubby love it a lot – been cooking it regularly since as it is so easy to cook. Yeah, great supporter of this recipe. You will fall in love instantly. Easy and hassle free. Quick, quick, give it a try, Mery. No regrets. Wow…so nice getting such a huge and fresh fish! I love the way your missus cook this fish. Looks pretty appetizing. Try cooking it – simple and easy and very nice. A lot easier than cooking the nyonya/Malay asam fish and just as nice, take my word for it. I love fish and I grew up eating fish. My father was a fisherman and he would save the best selection of fish for the family, cleaned and kept them in the freezer before he went out to the sea again. In Sandakan. Ooooo….even today, one can get such fresh fish there – right from the sea into the wok! Really sweet and really nice. Yes, the soup – you pour over your rice – will surely go for second helping, I tell you. And the best part is it is sooooo very easy to cook – curry can be such a hassle, really. Give it a try! I am sure you will want to cook it again and again and again. See Irene Tan’s comment – she’s a 100% convert!!! 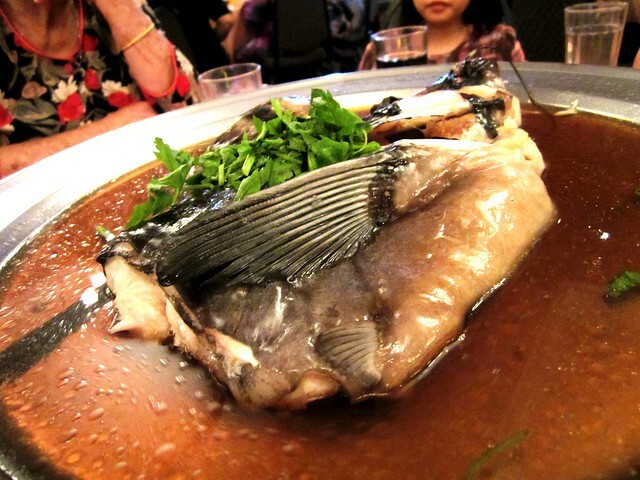 Steamed fish depends a lot on the fish – and personally, I think it is not half as nice. So you don’t like salmon then? 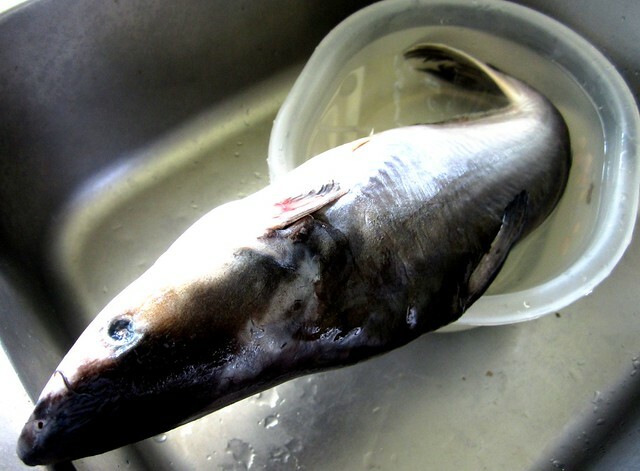 It has its own fishy taste…like some of the dark-fleshed fish. I don’t really mind but salmon, I would pass as it is soooo expensive. Would rather not eat. Your wife’s very wise – fish is anytime better than meat. I remember having the salt baked fish in Bangkok. It was very nice…mainly becos the fish was fresh. You cooked the whole fish? or just half? So little? That one only two slices lah – a lot more, ate for two days! I loved eating/sucking the head with the skin and the wobbly stuff inside – I think they sell that dried and serve as “fish lips” soup in Kuching – sharks’ fins soup style…last time cheap, now prices almost the same as sharks’ fins as very popular. And I loved eating the sides – the flesh so smooth and the layers of fat…oooooo…so lemak! If your mum has anymore from the supplier and can spare me one or two, ask her to call me – I will pay her, of course. Otherwise, don’t want! Must pay for them one, ya!!! Ok now, I hope. My BIL has this phobia for fish bones – would get one stuck in his throat, even when eating fish without bones. He’d get the big one stuck in his throat…and now, even when not eating fish! Last I heard, it was a duck bone – had to spend RM300 to see ENT specialist to get it removed. I think it’s all psychological! Phobia! What goes around comes around. Give…and thus shalt thou be given. Hehehehehe!!!! 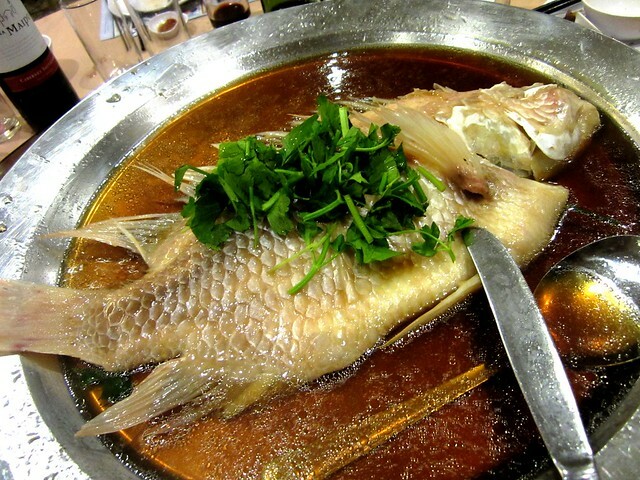 The steamed fish looks so delicious. I’m ok with steamed fish. All depends on the fish, of course. I am, I truly am…praise the Lord! Fish fish fish! My favorite! Yes, and the fatty/oily ones are the best – Omega 3. Nah!!! All the nice food, all the nice places there… I bet you’re spoilt for choice. Just can’t decide what to have. I hate fish with mud smell. 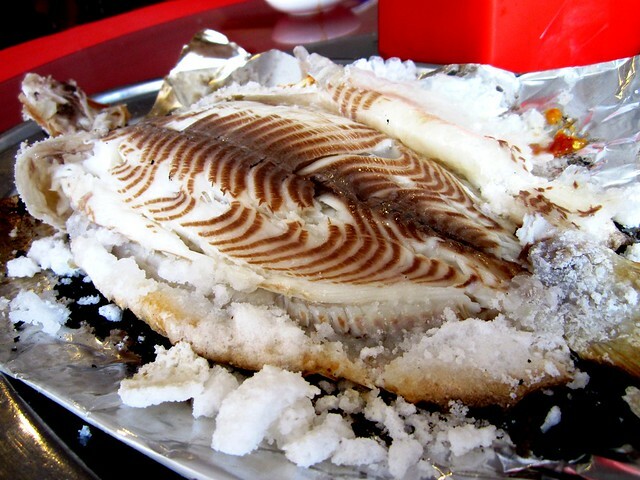 The salt baked tilapia reminded me of the salt baked snake head fish I have in bangkok. Yummy. I suppose they do not use tilapia there… They do here, and also the place where I had it in KL/Batu Caves. I hate fish with small bones, that’s why I like larger fish especially the fish head. Batang Ai fish is pretty alright. BTW, we always think of you when we see canned ham now. Haha! Good grief!!! I can imagine the picture in your minds – me as Napoleon, the character in “Animal Farm”! 😦 Muahahahahahaha!!!!! Ya…unfortunately, the best fish from upriver – the ones worth their weight in gold – have lots of little bones. Quite a chore eating them but they’re so very nice. homie and i usually will just stick to salmon, dory and this-fish-without-scale-one. and we’ll add slices of ginger if we do steamed fish, to omit the fishy smell. I know some people will not touch dory…but I’m fine with it. You’ll have to live overseas – they fillet their fish for you…or you can buy them already done in the supermarts. Not surprised if these kids abroad have never seen a live fish before…or a live chicken, for that matter. Yup! Nice one. I think that one, and the chocolates, sold in conjunction with Australia Day…hence, the flag. I guess they have running water…not stagnant fish ponds – that’s the main thing to prevent that mud smell. We have some here, but not all…so we’ll never know unless we have a trustworthy fishmonger. Fish is my top choice of meat and I love them fried or in curry. How come I always see everyone buying you tins of hams! I see that they are all imported hams and none are from China! i am so scared of hams from China as they could always blend in dog or chicken inside! I love these too…but these are not suitable for steaming. I’m not really into steamed fish anyway, so it’s fine by me – will just cook them some other way. Pingback: Still rockin’… | ...Still crazy after all these years! Pingback: Cornershop… | ...Still crazy after all these years! Pingback: Bad reputation… | ...Still crazy after all these years!